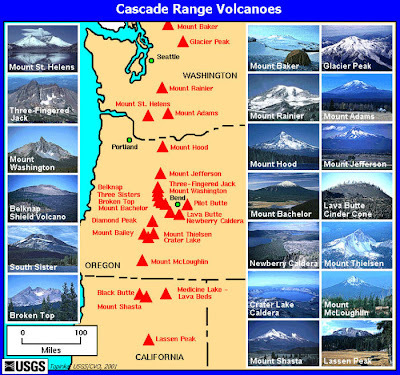 T he Cascade Range on the west coast of the U.S. is not only characterized by earthquakes and their stories, but especially by volcanoes and them too became incorporated in local legends. "this mountain has never been visited by either whites or Indians; the latter assert that it is inhabited by a race of beings of a different species, who are cannibals, and whom they hold in great dread." Other stories recorded by ethnologists tell of displacing encounters "Sometimes people would hear three whistles, and soon stones would begin to hit their lodges. Then they knew that the giants were coming." Also Spirit Lake was named after an old tradition involving evil spirits and therefore a place to avoid - according to this myth the salmons found in the lake are the transformed ghosts of evil people. Fig.1. 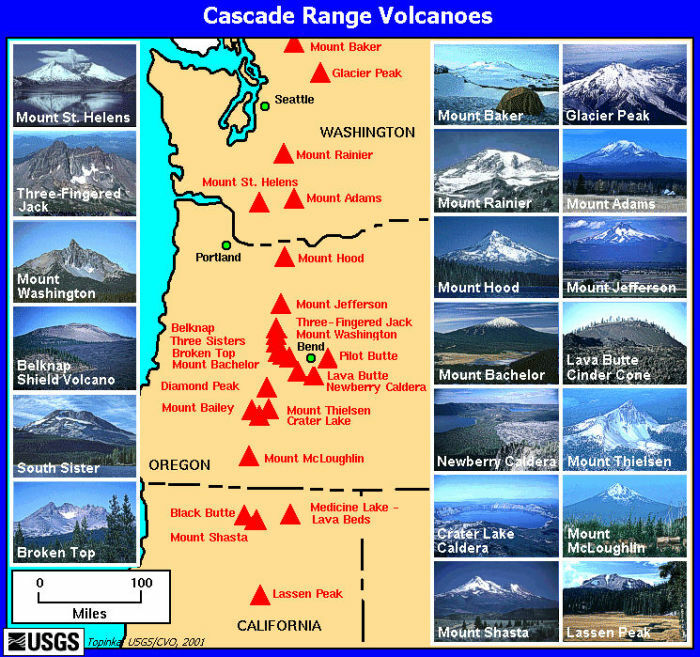 Cascade Range Volcanoes from the U.S.G.S. This caution was maybe influenced by the experience of eruptions of the Cascade volcanoes in prehistoric times. The Klamath people of Oregon tell of the time when the chief of Above World - called Skell- and the chief of Below World - called Llao- decided to settle the dispute which of them was stronger. For many days the fight raged over the land, the two adversaries' hurled rocks and flames at each other and soon darkness covered the land. To better see his adversary Llao decided to climb on the highest mountain he could find - the ancient volcano Mount Mazama - but as soon he reached the peak the mountain collapsed with terrible thunders and hurled him back into his underworld domain. The large hole that remained was then filled up with water and became known as Crater Lake. An eruption in 1800 at Mount St. Helens, known by the locals as Tah-one-lat-clah - "the Fire-Mountain" caused most concern, the Spokane Indians of eastern Washington thought that "the world was falling to pieces" and the Kalispel of northern Idaho, who remember a rain of "cinders and fire", supposed "that the sun had burnt up, and that there was an end of all things." Other mountains were also regarded as dangerous or inhabited by malevolent spirits. According to one legend once Mount Baker, known previously as Komo Kulshan, one day got so mad that a big piece fell off and slid way down the mountain, causing a big fire and lots of noise. Mount Rainier, or Tacobud, also one day take a breath so deep that she burst her blood vessels. All over her body, rivers of blood gushed forth and flowed down her sides. Additionally Mount Tacobud was even inhabited by a terrible flood causing monster, which however was finally defeated by some mighty warriors. Mount Hood, or Wyeast, was also a mountain haunted by evil spirits who "became so angry that they threw out fire and smoke and streams of hot rocks.. and caused "rivers of liquid rock [that] ran toward the sea, killing all growing things and forcing the Indians to move far away." Unfortunately this time the great chief, that battled the spirits, by scarifying his life was only capable to entrap them, so it is still possible that they will return. Even if some stories resemble the description of an eruption followed by pyroclastic flows and ash clouds, caution must be adopted to ascribe every myth to a specific and real eruption. Many volcanoes erupted thousand of years ago (like Mount Baker-6.000 years, Mount Rainier- 2.000 years or Mount Mazama- 6.000 years) and it is hard to imagine that oral traditions were passed unmodified trough so many generations and changing cultures in such vast time periods. 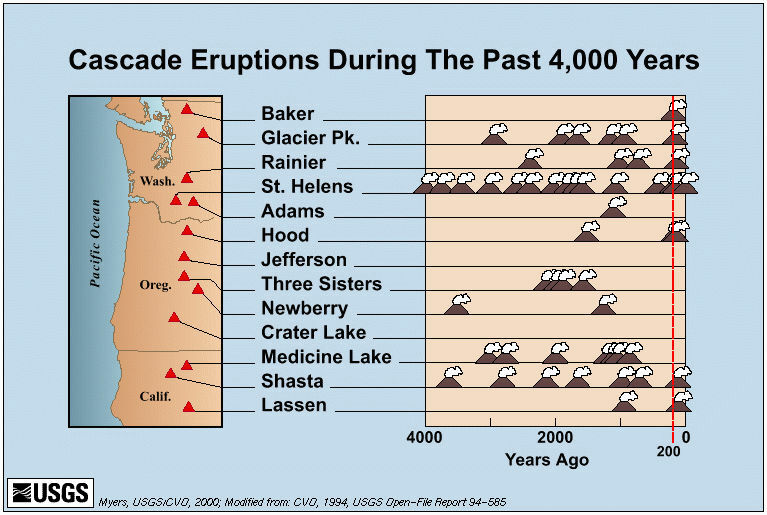 Still it is possible that some legends were really inspired by relatively recent eruption like on Mount Hood or Mount St. Helens and that these myths were subsequently adopted to other, maybe similar looking, mountains or regions. Fig.2. 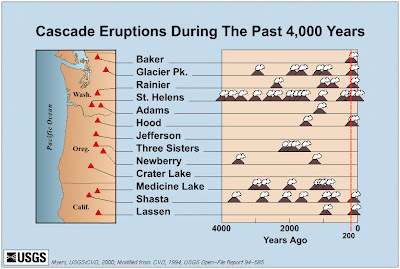 Cascades Eruptions During the Past 4000 Years, from the U.S.G.S. Not only active or dormant volcanoes, also extinct volcanoes and their landscape influenced the mythology of North America. The Devils Tower is the eroded neck of a volcano located in north-eastern Wyoming. The name assigned to the monolith by several of the local tribes mention surprisingly often the bear - like Bear's House (Cheyenne, Crow), Bear's Lair (Cheyenne, Crow), Bear's Lodge (Cheyenne, Lakota), Bear's Lodge Butte (Lakota), Bear's Tipi (Arapaho, Cheyenne) and Grizzly Bear Lodge (Lakota). Two Indian tribes living in the vicinity have slightly different stories accounting for its unique shape, but both involve a group of people being pursued by a giant and angry bear. Exhausted the Indians appealed to their deity for help, suddenly the ground on which they stood raised to the sky, forming a smooth pillar. The bear tried to climb the pillar; the claw marks (a classic example of columnar jointing) made by the bear as he tried to reach them are still visible today. In California the outcrops of volcanic obsidian glass were an important resource for tool making and considered a gift by spirits or ancient heroes. 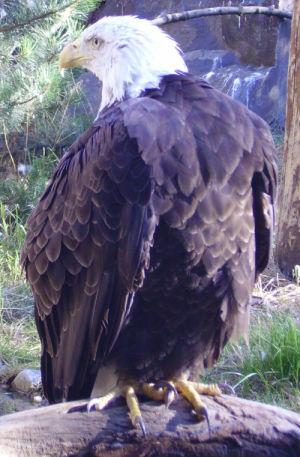 According to one myth an enormous eagle or condor, the spirit Milili, once scattered all around over California pieces of obsidian, which shattered on impact on the ground. Maybe this could explain the chaotic appearance of some of the ancient lava flows from which obsidian was gathered. The Wintu Indians of northern California once didn't possess obsidian and therefore their weapons were not much useful to hunt deer. One day the great hunter Adder arrived, who possessed such an extraordinary weapon made of this particular volcanic rock that he managed to kill many deers in just one day. The Wintu hunters became envious, and so they asked Ground squirrel to steal one of the arrows of Adder. Ground squirrel managed to extract a piece of obsidian from one of the hunted deer and run away, but Adder soon noticed the thievery and set the world in fire. Ground squirrel escaped and dropped his load where today is located Glass Mountain near Mount Shasta- however the piece of obsidian carried on his back burned his skin so bad that still today his descends display a black mark on their back.